Jamper ransomware is a dangerous malware form which was lately discovered by a computer researcher named Michael Gillespie. This file-encrypting threat affects Windows computers by injecting rogue registry keys and running malicious processes. These actions allow Jamper virus to launch the encryption code and block all files that are found on the targeted device. Later on, all affected data appears with the .jamper extension and an informative —README—.TXT message bombards the computer screen. 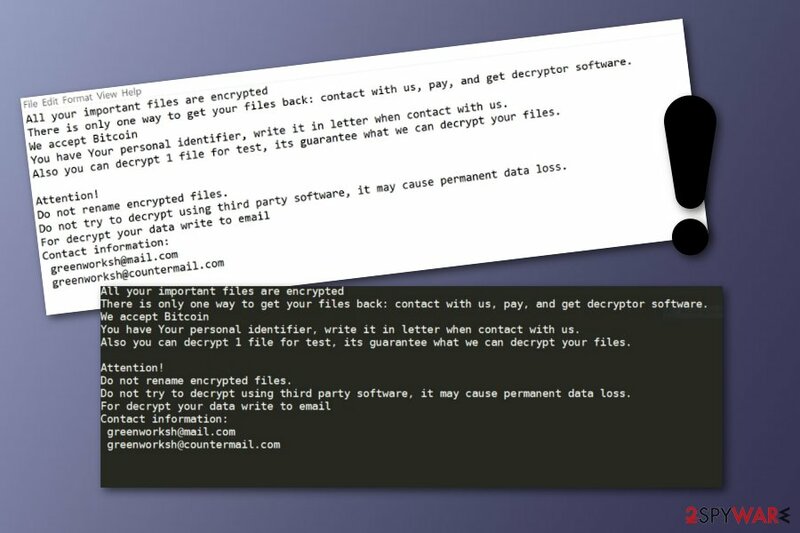 Ransomware developers threaten users that their files are locked and can be recovered only by purchasing the decryption key from the crooks. These criminals, as most of the hackers, urge for Bitcoin as such transfers always remain secret and untrackable. Moreover, these people provide some contact information for the victims: greenworksh@mail.com, and greenworksh@countermail.com email addresses. Jamper ransomware is known as a data locker which uses AES cryptography to execute the unique code and encrypt all files that are found on the infected Windows computer system. Once data is blocked, users are not capable of accessing the information properly anymore. Once tried to open, the file usually appears broken or does not launch at all. As an alternative, we recommend trying some data recovery software which might appear to be helpful and let you restore some of your important locked files. However, first, you need to remove Jamper virus and all malware-related content from the system which can be detected by anti-malware programs such as Reimage or Malwarebytes MalwarebytesCombo Cleaner. You need to take fast actions against the file-locking malware and perform the Jamper ransomware removal as soon as possible. Such malware sometimes comes with several hazardous and damaging features. For example, ransomware might also be capable of installing other dangerous computer viruses on the system or running infected payload in different locations. Additionally, Jamper ransomware might be capable of bypassing the computer's security programs which allows it to freely distribute on the entire system. Nevertheless, this file-encrypting threat might be capable of launching a module which collects sensitive information about the user. All these malicious activities might renew themselves with each computer boot if the virus has not been terminated correctly. It does not matter if you have an antivirus program or not if you do not take care of it properly. Antivirus software is truly a helpful option to avoid possible malware infections and keep your computer system always clean. However, you will need to perform regular updates once in a while to make sure that the program functions properly. Continuously, according to technology experts from the LosVirus.es page, ransomware distribution is related to email spam campaigns. Be aware that crooks might drop messages claiming that they are from official organizations and are writing for very important purposes. Investigate the letter before opening any clipped attachments. If you are looking for ways to get rid of the dangerous ransomware infection, you have come to the right place. First, you need to gain some basic knowledge in the Jamper ransomware removal process. Note that, manual elimination is not a possibility in this case and you will need to lean on the protection of anti-malware software. Before you remove Jamper virus from your Windows computer, you need to find all malicious components that are hidden in different locations of the system. For such purpose, we recommend users installing and launching specific programs such as Reimage, Malwarebytes MalwarebytesCombo Cleaner, or Plumbytes Anti-MalwareMalwarebytes Malwarebytes. After that, check out some data recovery purposes that are presented and detailed below this text. Log in to your infected account and start the browser. Download Reimage or other legitimate anti-spyware program. Update it before a full system scan and remove malicious files that belong to your ransomware and complete Jamper removal. When a new window shows up, click Next and select your restore point that is prior the infiltration of Jamper. After doing that, click Next. Once you restore your system to a previous date, download and scan your computer with Reimage and make sure that Jamper removal is performed successfully. Guide which is presented above is supposed to help you remove Jamper from your computer. To recover your encrypted files, we recommend using a detailed guide prepared by 2-spyware.com security experts. .jamper files is a sign that Jamper ransomware has occupied your Windows computer system and encrypted all objects found. Rather than paying the ransom price and risking to get scammed, we offer to try some data recovery tips that are provided below. This method might appear to be very helpful if you use the tool exactly as shown in the instructing guide. Complete each step as carefully as possible to reach the best results. Note that, this method might not work properly if you did not activate the System Restore function before the cyber attack took place on your computer. If the ransomware virus did not eliminate your files' Shadow Copies, you should give this data recovery method a try. Currently, computer experts are working on Jamper ransomware official decryption key. ^ Danny Palmer. What is ransomware? Everything you need to know about one of the biggest menaces on the web. ZDnet.com. News articles. ^ LosVirus.es. LosVirus.es. Spyware news. ^ James Cope. What's a Peer-to-Peer (P2P) Network?. Computer World. Articles. 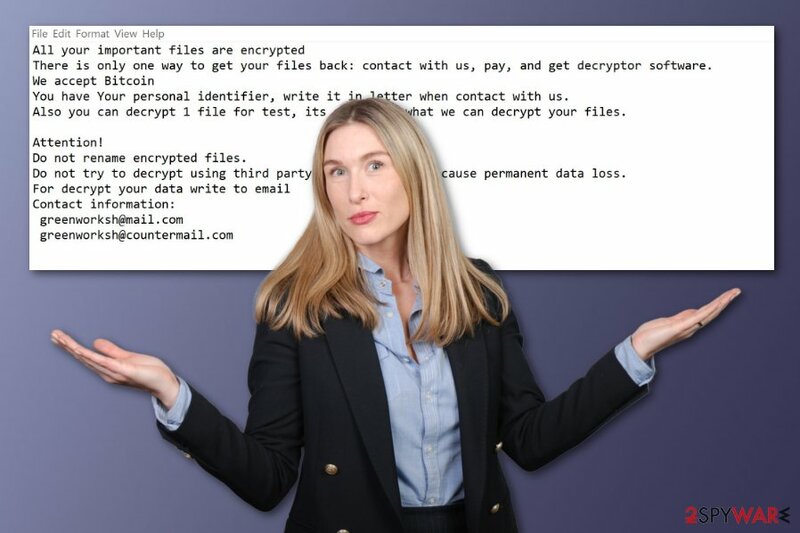 This entry was posted on 2019-03-20 at 05:41 and is filed under Ransomware, Viruses. You can quickly scan the QR code with your mobile device and have Jamper ransomware manual removal instructions right in your pocket. How did you remove Jamper virus?